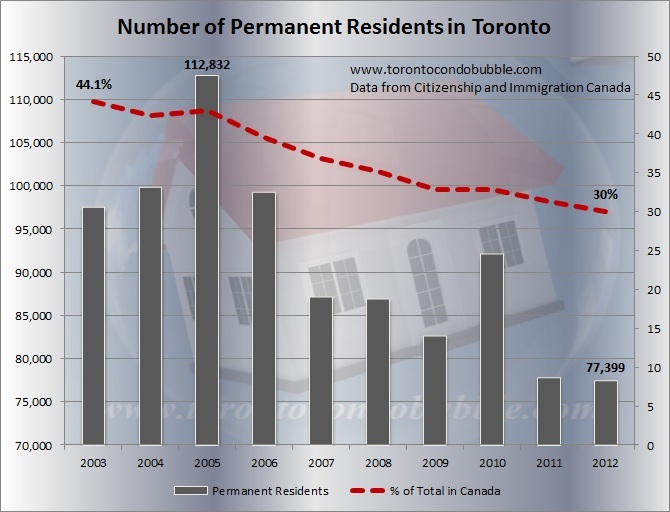 In 2003, 44% of all permanent residents in Canada resided in the GTA. Fast forward to 2012 and that number decreased to 30%. 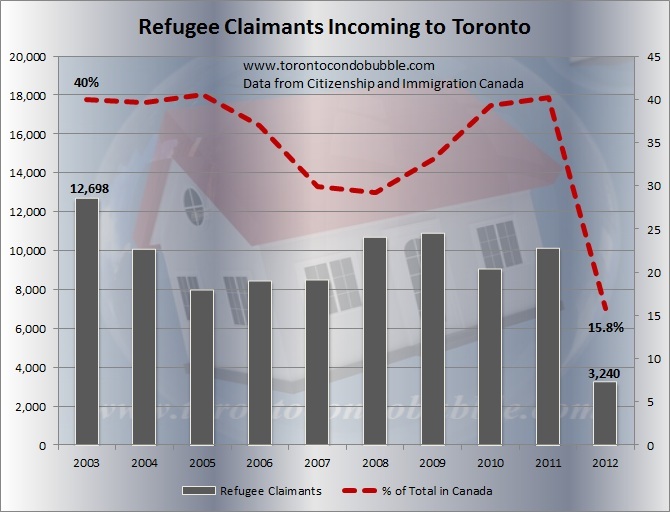 Less and less immigrants are coming to Toronto. I wonder why! 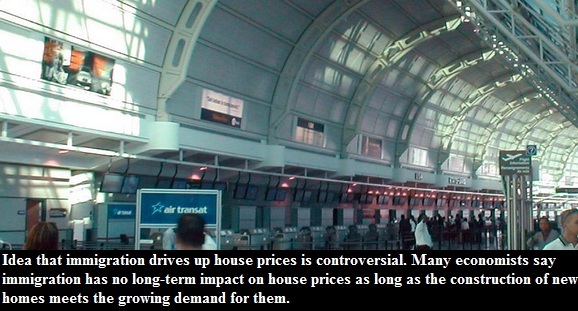 Hmm, maybe it has something to do with overvalued property prices? Speaking of home prices, during the first two weeks of February the average home price in the GTA increased by almost 8% compared to a year earlier. Detached homes rose 15% and condos went up by 5% in the 416. But home prices are overvalued pretty much everywhere in Canada so it's probably not the housing costs scaring immigrants away from Canada's largest city. Maybe it's the traffic on the 401? Anyway if you believe that immigration is driving up home prices in Toronto then you should really take a look at the graph below. Furthermore, I suggest you read a paper by the Cambridge Economist (pdf) who suggests that immigration can actually drive down local real estate values. If immigration was really the main engine behind real estate appreciation then wouldn't you expect that with less and less immigrants coming to the GTA that home price growth would decelerate? On the bright side, the number of foreign students coming to Toronto is increasing. Hmm, maybe they'll rent all those condo units which are scheduled soon to hit the market. There were over 66,000 foreign students in the GTA in 2012. Way more than I would have ever imagined. Also more and more foreign workers are coming in. But they are here for a short time. At least that's the idea. There were 64,000 foreign workers in the GTA back in 2012. Overall, there were 338,000 foreigners working in Canada in 2012. 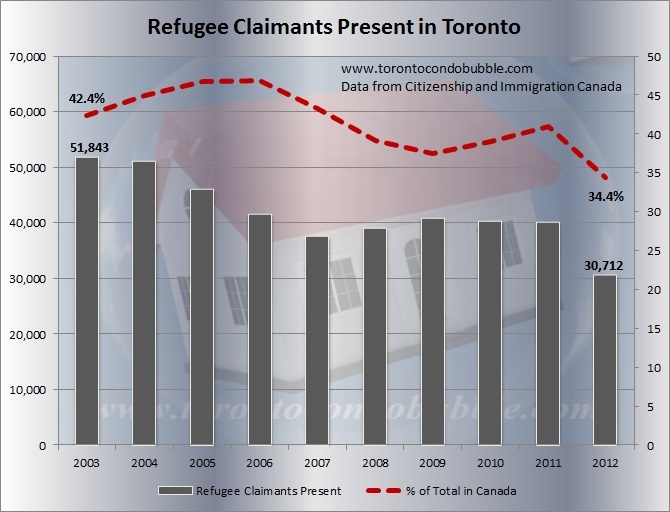 Interestingly, the number of refugee claims in Toronto dropped significantly in 2012. In the upcoming days I will post similar graphs for the whole of Canada. Stay tuned.